The new compact Miele CM5 fully automatic freestanding coffee machine. Miele's Kitchen Experience for inspiration. From exquisite homeware and sophisticated coffee machines to state-of-the-art cooking appliances and washing machines, thrill your loved ones and bring some surprise into your home with Miele’s generous offers. 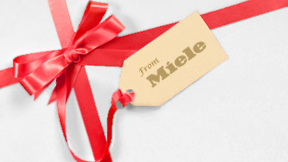 Click here to find all of Miele’s most up-to-date as well as seasonal promotional offers. Miele builds industry leading appliances, but don’t take our word for it. Experience the wonders of Miele for yourself at one of our Miele Experience Zones in locations throughout Hong Kong or enjoy a fully immersive and interactive experience with world class chefs and experts at the Miele Experience Centre. So come along and see what all the fuss is about. The philosophy behind the design and creation of the Miele Experience Centre adheres to the perception of Miele not only manufacturing "appliances" but rather promoting elegant design, quality products and a desirable lifestyle. We simply want to show that Miele has the most beautifully designed products available.